One World is Bob Boyd, Keith Ricks, and the rhythm of the Islands. They’d have been happy just to fill the air with their celebration of life in Key West, but their music is so infectious it has permeated the island town and has become the soundtrack to thousands of legendary sunsets. In fact, their “Island Favorites” CD is the best selling Key West album of all time. Bob with jazz piano roots and Keith, a funky bass guitar player from Bermuda, met in Key West at a late night jam session and quickly became great friends. 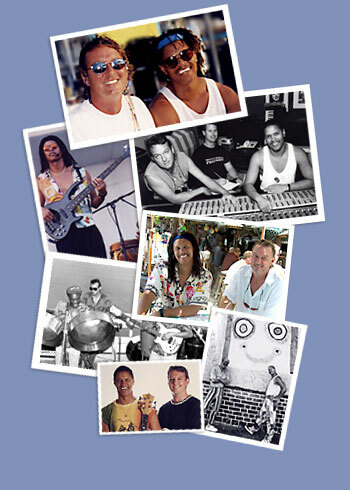 Somehow the lure of the laid-back island lifestyle of Key West led them into the world of calypso, ska, and reggae. They’ve been recording and performing original Key West music since 1991. They also wrote and performed music for James Bond’s “License to Kill, and their legendary “Dancing Iguana” music video “Bump” is a favorite on the Caribbean Satellite Network. Check out Iggy's moves here. You’ll also hear their music at the “Key West” Village at Sea World in Orlando, FL. Want to learn more about One World? Our story is our music. You can check out all of our albums here. Or go to the online store and get the Island Groove at home or work.